This silver and gold card is so sparkly and pretty in person. It makes me want to sing the “Silver & Gold” Christmas song. I used the ornaments from the Carols of Christmas stamp set for the centre of the snowflake. 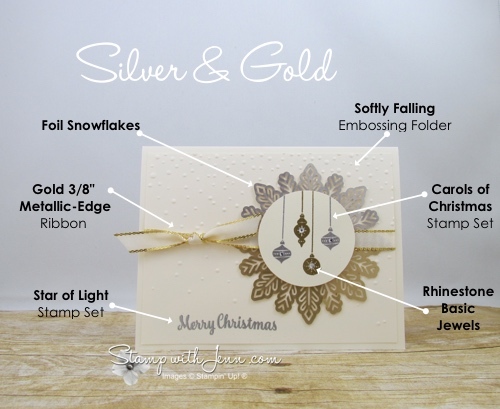 Gold and silver together on a card look so amazing and “Christmasy”. And the little rhinestone in the middle of each ornament gives it some extra bling. The Carols of Christmas stamp set will be in the Holiday Catalogue that starts this Friday! If you would like a copy of this catalogue, please let me know at fun@stampwithjenn.com. The Holiday Catalogue will also be online here on my website on Friday. The stamp set is available NOW as a special pre-release item (just click here to get it in my online store). Also on this card is the gorgeous metallic snowflakes that will also be in the Holiday Catalogue. I cut the snowflakes in half so that my snowflake would be half gold and half silver. I also cut the ornament stamp apart (I know gasp!). I often cut apart stamps to make them work for me because they can always be put back together on the block. I wanted more than the 3 ornaments on my circle and I wanted to have them be different colours. 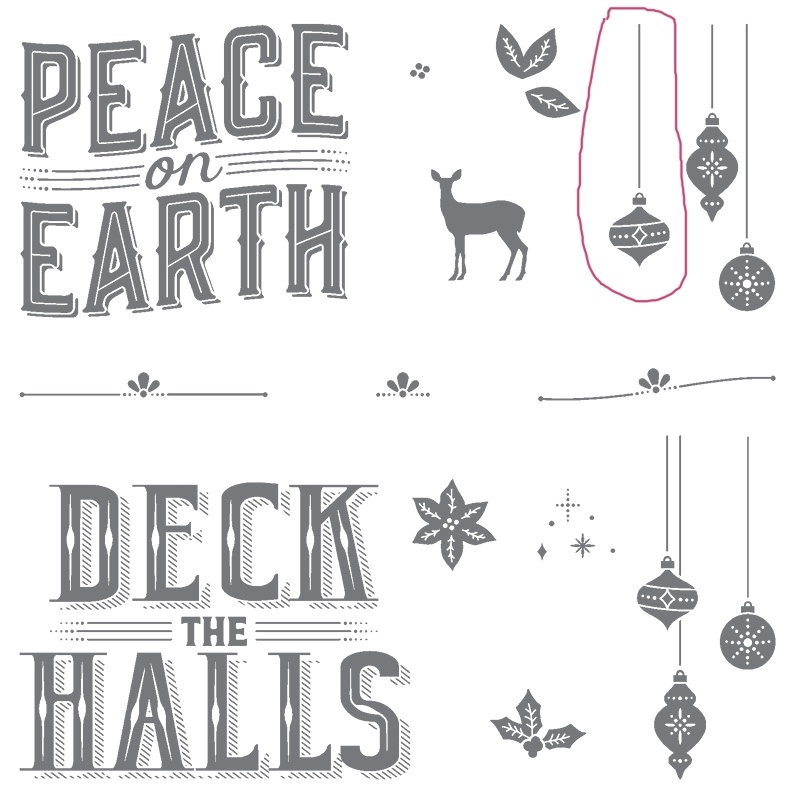 Rather than fool around with masking and carefully putting embossing powder only on certain ornaments, I cut off the one stamp (the one circled in red above). Then I was able to stamp and emboss the middle ornaments in gold. Then I stamped the single stamp on either side and embossed it with silver embossing powder. Check all the supplies used on the card listed below. Check back to www.stampwithjenn.com this week, and I’ll have some more cards to show you featuring new Christmas stamp sets from the Stampin’ Up! 2017 Holiday Catalogue.